Please note that tournament details on this page are subject to changes or revisions until the show. 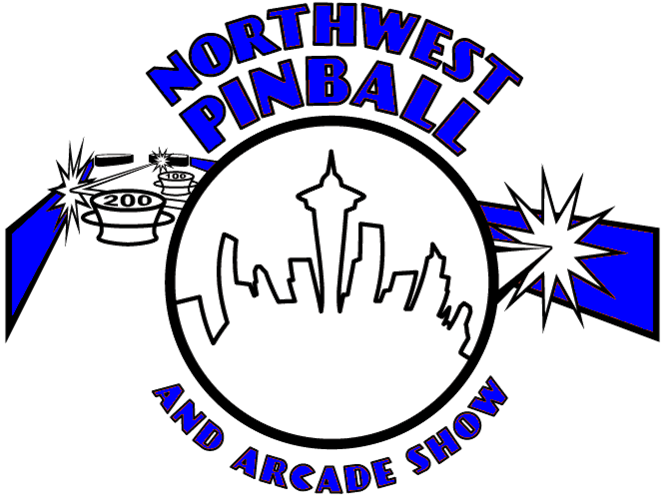 NWPAS is proud to be host of the Largest Women's Pinball Tournament in the world! 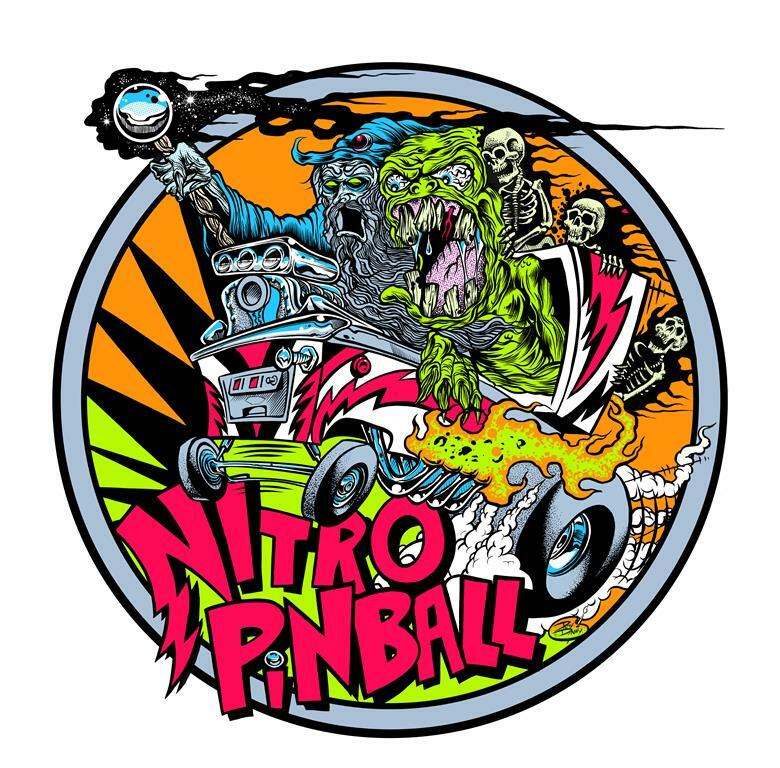 And for the 4th consecutive year, top prize will be a pinball machine. 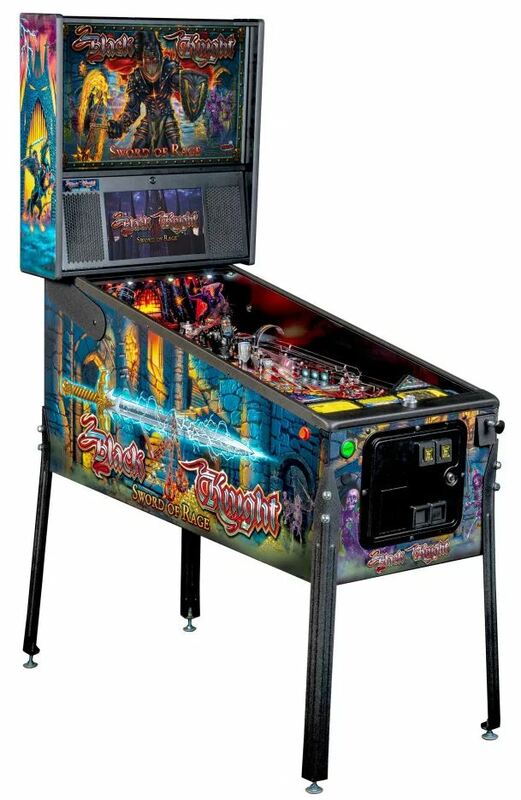 This year, the grand prize is a new pinball machine (Black Knight Sword of Rage Pro), donated by Nitro Pinball. 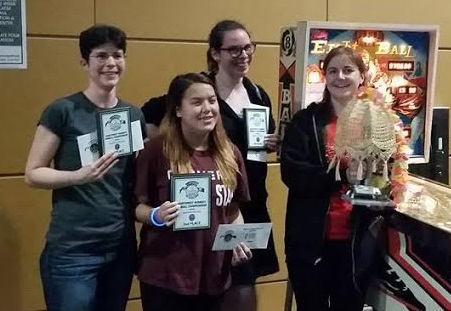 In 2016, the NW Women's Champion competed in the Nitro Rising Star match, against winner of B Division, and B-Eligible players who qualified for A division finals, to battle for the pinball machine. Zoë Vrabel who qualified by finishing 5th in A division won, with Hannah Holmberg finishing second. Starting in 2017, that final match has been eliminated. 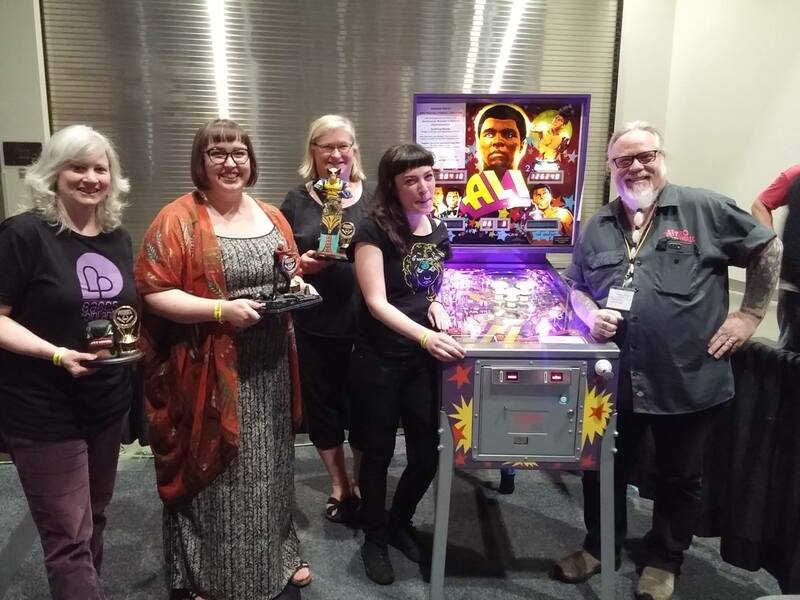 Instead, the NW Women's Champion will win the pinball machine prize.  Registration for Friday round opens Friday 2:00pm, closes 15 minutes prior to the round, or sooner if round fills up.  Registration for Saturday round opens Friday 6:00pm. Registration closes 15 minutes prior to the round, or sooner if round fills up.  Quarter Final Round, Match Play, 4 Games, 3-Player Groups: Saturday 7:30pm-9:15pm. 15 or 21 players depending on number of entries. Semi Final Round, Match Multi-Play, 4 Games, 4-Player Groups: Approx. Saturday 9:15pm-10:00pm. 8 players. Final Round, Match Multi-Play, 4 Games, 4-Player Group: Approx. Saturday 10:00pm-10:45pm. 4 players. Championship Game, final 2 players: Approx. Saturday 11:00pm. $20 Entry Fee for one qualifying round. Additional $20 to retry in a second qualifying round.  New Players, $10 off entry, if you've never played in an IFPA-ranked tournament.  Rookie Players, $5 off entry, if you've played in five or less IFPA-ranked tournaments. Note that this championship is available to Women in addition to the other tournaments at NWPAS. Women are encouraged to participate in the Match Play and PinGolf Classic events, as well as the Rookie&Amateur Event if eligible, for alternate chances at big cash and prizes. The schedule has been setup such that the women's championship final does not conflict with the finals in any other division. The tournament will be played on the Main Tourney Bank of machines with two qualifying rounds. Each qualifying round operates independently, with the winner of each round getting a bye into the semi-finals, and the top 9 or 12 players (depending on round) moving on to quarter finals.  There will be a maximum of 96 players in each round.  Each round consists of a 5-games of match play that will include 4-player and/or 3-player games on five different machines against varying opponents.  With 60 or less players, tournament format uses same partial round-robin format as Open Match Play format, with NWPAS Game Scoring.  With over 60 players, up to 96 players, different software is needed. In this case, matchplay.events software will be used, and scoring changes to IFPA Scoring, and machines will be drawn one round at a time. Some matches won't start at beginning of round while awaiting free machines; they will be drawn only after some other matches are in that round are completed.  The winner of each round moves on straight to the semi-finals.  Prior to the start of each game in a round, matches will be posted on the main tournament computer screen, as well as posted online. A tournament official will place a scoresheet on each machine, then announce the start of the game. At that time, players should proceed to the machine they are schedule to play on, verify on the scoresheet that they are at the right place, then begin play when all players are present.  Order of play is as shown on the scoresheet for that game. Playing out of order at any time will result in a disqualification, and a recorded 0 points for that game.  Any ties at the end of the round will be resolved by the tie breaking procedure listed below.  Note that while the software used does attempt to balance matches, it is possible face the same opponent or play the same machine more than once during the round.  The quarter-final round will include 21 players.  This round consists of a 4-game partial-round-robin format, as 3-player games, where each player will play different opponents and machine each game.  The top 6 players move on to the Semi Finals.  In case of a tie to advance to next round, tie-breaking procedures listed below will be used.  The semi-finals will be played using a 4-player Match Multi-Play format.  4-Player Match Multi-Play is a format where four players play 4 games simultaneously. A bank of 4 machines is selected for the match. A player will be player 1 on one game, player 2 on the next game to their right, player 3 on the 3rd game, and player 4 on the 4th game. Each player starts on a different machine. Play begins with all players starting their first ball at the same time. When they are done, they play their first ball on the next machine, when the prior player is done. This repeats until each player has finished ball 1. Players continue to rotate through ball 2 then ball 3, until each player has played all three balls on all three machines.  IFPA Scoring will be used during this round.  Points from each game are added up. Winner is player with highest sum total from all four games.  Two players with most points in each group move on to finals.  Third place in each group finishes tied for 5th. Fourth place in each group finishes tied for 7th. In case of a tie to advance to next round, tied players will play a ONE-BALL SUDDEN DEATH tie-breaker on a randomly-selected machine from the bank they just finished playing.  Finals will proceed as a 4-player Match Multi-Play, similarly as semi-finals with the top 2 players of each semi-final group.  The final four machines will use two of the machines from each of the two semi-final banks of four machines. 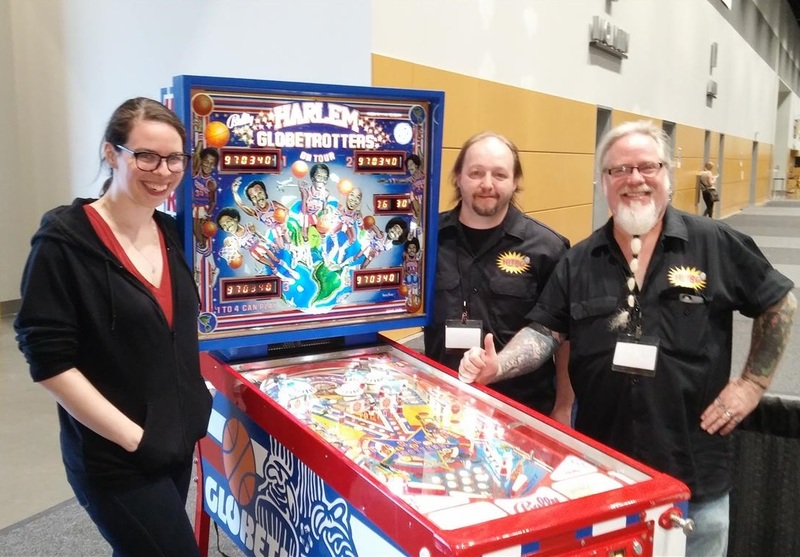  The two players with the most points will play one final championship game on the prize machine, to determine the winner of the championship and of the pinball machine.  The player who won the finals multi-play round gets choice of play order. If both players were tied, order selected by coin flip.  One of the four finals machines will be randomly selected to be used as the backup if for any reason the championship game cannot be completed on the prize machine. New Pinball Machine (Title TBD) for the winner. $500 for 2nd place. All players that reach quarter finals will receive prize money of at least $30. 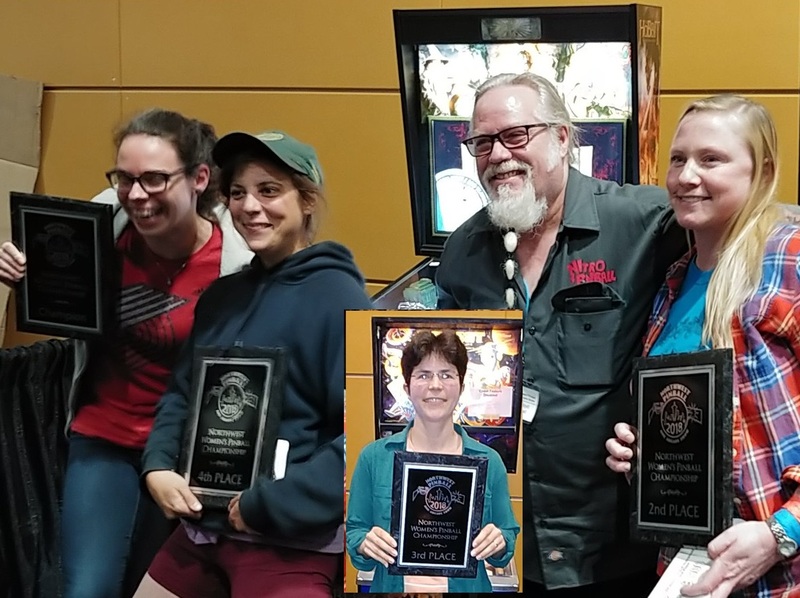 A bonus-point scoring system will be used in all rounds of the NW Women's Championship and NWPAS Open Match Play Tournament, except the match multi-play semi-final and final rounds. Scoring for each game will depend on the number of players in the game.  1st place player earns bonus point if score[1st place] > score[2nd place]+score[3rd place], else 3rd place player gets that bonus point.  2nd place player earns bonus point if score[2nd place] > score[3rd place]+score[4th place], else 4th place player gets that bonus point. This means 1st place player gets 6 or 7 points; second place player gets 4 or 5 points. Third place player gets 3 or 4 points, and 4th place player gets 1 or 2 points.  2nd place player earns bonus point if score[2nd place] > 2 * score[3rd place], else 3rd place player gets that bonus point. This means 1st place player gets 6 or 7 points; second place player gets 4 or 5 points. Third place player gets 1, 2, or 3 points. Two-player games will be avoided, but they could happen due to forfeits or missing players.  Winner who does not double opponents score wins 5-3.  Winner who doubles opponents score, but has less than triple, wins 6-2.  Winner who triples opponents score, wins 7-1. Multi-Play is a format where three players play 3 games simultaneously. A bank of 3 machines is selected for the match. A player will be player 1 on one game, player 2 on the next game to their right, and player 3 on the 3rd game. Each player starts on a different machine. Play begins with all players starting their first ball at the same time. When they are done, they play their first ball on the next machine, when the prior player is done. This repeats until each player has finished ball 1. Players continue to rotate through ball 2 then ball 3, until each player has played all three balls on all three machines.  2nd place gets 2-points.  3rd place gets 1-point. Points from each game are added up. Winner is player with highest sum total from all three games. If a player is a no-show after 3 minutes from when start of Game 1 is announced, the game will start with player included, and their balls will be plunged by a tournament official. If they arrive, they can play remainder of their game. Regardless of whether or not the player shows, the game will be scored as though the player is present. If a player is a no-show for the entire first game, they will be disqualified for the entire round. The player will be removed from subsequent games, and other players in those games will score the game using one less player scoring. Any player that is disqualified in a game due to a ruling receives 0 points for the game. The other players score the game including the disqualified player, and assume a score of 0 for that player. Please note that we do not have a woman running this tournament, only because we want all women to have the opportunity to compete for the championship without being distracted or have possible conflicts of interest with trying to run this event as well.